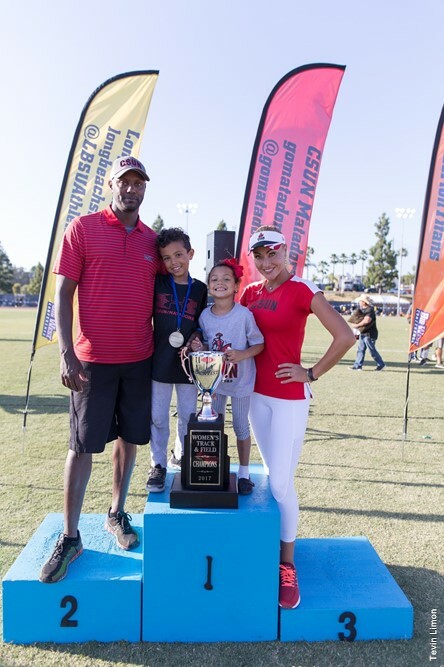 CSUN Track and Field coaches Avery and Bridget Anderson somehow found the time to balance work, family and school to graduate with Master's in Public Administration degrees from CSUN. Photo by Lee Choo. The Andersons celebrate the 2017 Big West Women's Track & Field Championship. Photo by Tevin Limon/CSUN Athletics. It used to be that graduate students were often pegged as scholars so entombed in their studies and their campus libraries, they rarely saw the light of the day. There was usually not time for a family or children or even a social life. Now imagine having two young children and managing four track & field and two cross country programs and the student-athletes that entails all while pursuing a master’s degree with your spouse. 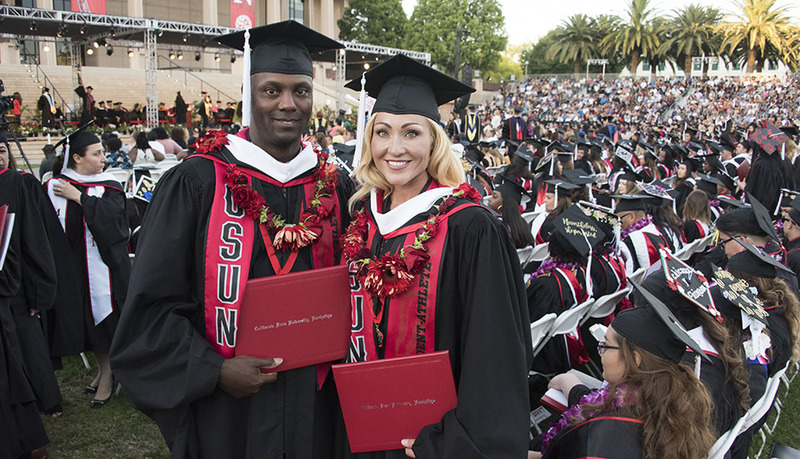 Although it seems incredible and nearly impossible, CSUN track & field head coach Avery Anderson and his wife Bridget Anderson, an assistant track & field coach with the Matadors, finally accomplished the feat on the evening of May 21 when they graduated from CSUN with their Master of Public Administration degrees with an emphasis in Leadership. Like some of the races their student-athletes compete in, the experience was a long and grueling test which made crossing the finish line that much sweeter for the two track & field coaches. The Andersons’ story is one steeped in college athletics. The couple met as track & field student-athletes at UCLA, married in 2009 and have two children, son Andy and daughter Avery. While at UCLA, Avery competed in both football and track & field while Bridget competed in the pole vault and javelin for the Bruins. Avery is in his seventh season as the Matador head coach and 13th overall with the program. Before taking the helm of the program, he worked under CSUN legend and U.S. Track & Field and Cross Country Coaches Association Hall of Famer (USTFCCCA) Don Strametz. This 2017 campaign is Bridget’s 12th with the Matadors and she works with the CSUN pole-vaulters and multi-event student-athletes. For the family, education is paramount. With son Andy and daughter Avery, the Andersons make it a priority that they spend substantial time each day working on reading, writing and other fundamental skills. So when they decided to take the plunge into graduate school after a lengthy break from the classroom, they knew they had to be fully committed. The names of their favorite professors roll off their tongues like close friends and Avery is quick to point out that Bridget is graduating with a 4.0. Of course, getting there is a story in itself. “Obviously, Avery and I have not slept for the past few years,” Bridget said with a laugh. Both mentioned that managing around 100 athletes in over 20 different events is a lot like public administration. Traveling, getting hotel rooms, buses and food for a traveling party of 70 can be a daunting task. One factor that re-assured the Andersons was the support they got from their parents, something that had to increase with the foray into a post-graduate degree. “We had to schedule classes together to keep our babysitters from going crazy and some nights Bridget would have to save a seat for me because issues with the team would keep me late,” Avery said. One thing that never wavered was their commitment to their studies and to their kids’ studies. Bridget admitted to studying in the kids’ rooms while they slept, the glow of the computer screen illuminating her face while she watched her babies. All that work culminated in comp exams, a lengthy written test challenging all that the Andersons had learned over the course of the program. The date for the exams was May 12, the same day as the opening day of competition at the 2017 Big West Track & Field Championships at Cal State Fullerton. So, the Andersons sacrificed the extra day of studying that most of their peers got and took the exams a day early. Then they there were off to Orange County. The Matadors had a sensational time at the 2017 Big West Track & Field Championships. The women’s side claimed six individual titles from four different student-athletes and won the team championship by claiming the 4x400m relay over UC Davis by a narrow .09 seconds. The team championship was the 10th for the women’s program since joining the league. For his efforts, Avery was named Big West Women’s Coach of the Year, the second time in his career that he has received the award. The team title was his third as the Matadors’ head coach and both coaching awards and two of the team titles came during his time enrolled as a graduate student. Now that the experience is over, neither are reticent to look back and reminisce wistfully. CSUN will be sending a large contingent of student-athletes to the NCAA Western Regional Preliminary Championships in Austin, TX on the campus of the University of the Texas from May 25-28. While it’s unlikely the Andersons will take a victory lap for their academic achievement, they may be able to claim fatigue from walking across the stage.